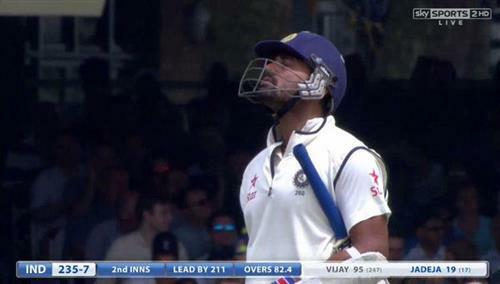 Vijay pinches a single to move to 92. Jadeja charges Anderson and flicks him to square leg. He picks up two runs. That was interesting. Anderson responds with a short ball that Jadeja defends to the offside. Broad's turn now to see what he can do with the new nut. His figures with the second new ball are outstanding. His strike-rate is 30 and average 18.9. Broad too far outside offstump. When Broad does get it closer to the stumps, Vijay sends the ball through the covers and collects three more runs. Vijay's judgement has been exceptional in this innings. FOUR! Broad strays down leg and Jadeja doesn't miss out. Tickles it fine. Anderson bowls a spiteful outswinger that draws Vijay into the shot but this is too good even for the India opener. OUT! No century for Vijay. Anderson bowls another outswinger and this time Vijay can't resist flirting with it and feathers a nick through to Prior. He slams the bat on the ground after rehearsing the stroke. Still, a superb innings and the ground ripples with applause as he walks off. India in trouble now though at 235 for 7. India only 211 ahead at this stage. England will fancy this now. Jadeja has 19 from 17 balls so far. He only knows one way to play. Four slips for Bhuvi, who meets a pitched-up delivery from Broad with the full face of the ball. Broad gets one to seam back and bounce at Bhuvi. Takes the inside edge and drops on the legside. Bhuvi didn't know much about that one. Broad bounces Jadeja, who is happy to pull him for a couple. Short again from Broad and Jadeja gets a single this time.
.@msdhoni has NEVER lost a Test defending a 4th innings target of 100 or more! 4 wins & 5 draws in previous 9 such instances. OUT! He strikes first ball. Pad then bat. Could impact have been outside offstump. Perhaps? But the umpire thinks not. Robson has to go. England 12 for 1. That was the arm ball. Robson played for turn that wasn't there. Hawkeye shows the ball did strike Robson in line. Jadeja getting the ball to bounce. Takes the handle of Cook's bat but loops to safety between leg-slip and shot leg. Ishant continues at the other end. Ishant produces a beauty that seams past Cook's defensive prod. 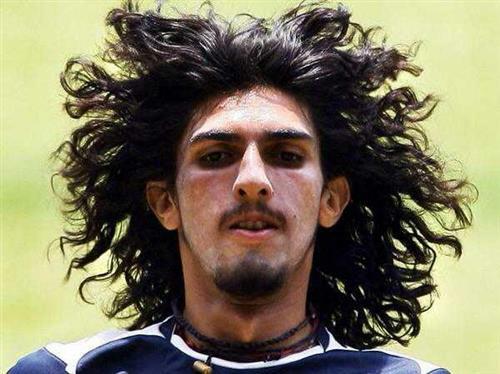 A strangled appeal from Ishant as he realises that beat everything. That is the cue for tea. England are 18 for 1 chasing 319. Both sides well behind the over-rate though. They are 9 overs behind. Shame that. Enough pockmarks there for Jadeja to salivate. England are going to have a very tough time. Jadeja starts with a maiden. Bhuvi is back. He is bowling to Cook. Cook and Ballance just looking to survive at the moment.